Americans sure do love blowing things up. And here are 111 amazing photos that prove it. 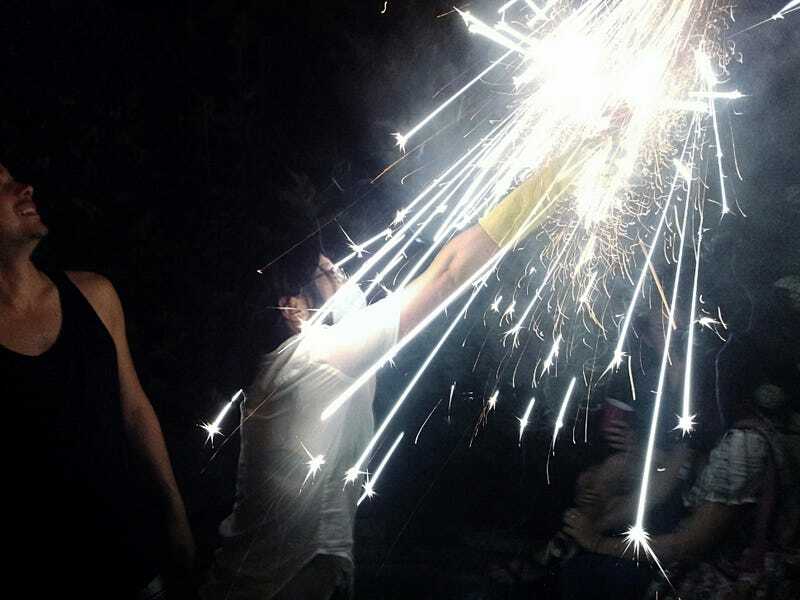 Safety First: Pretty standard Fourth of July backyard BBQ. Cold beers, hot meats, and bottle rockets. My friend was afraid the sparks from the rockets would burn so she threw on a dish glove and a surgical mask and let them fly. Taken with my Samsung Galaxy SII. Some slight post processing done in GIMP. Every year Cedar Point in my hometown of Sandusky, OH has been shooting off fireworks for the 4th of July. You can get great views of them without even being at the park. I found a nice spot across the Sandusky Bay, but wasn't sure exactly what type of shot I wanted. Luckily I was able to get the water, the park, and a great explosion all in one. I debated on turning in the Black & White Version, but thought the color was more festive. The technical stuff: Canon EOS Rebel T3, 75 - 300 mm lens, ISO 100, f/4, 2.0s. This was the second year of our traditional "shoot fireworks in our driveway" celebration of July 4th. Here in the Bay Area, you can only shoot "safe and sane" fireworks. Plenty of neighbors were launching the illegal fireworks and M-80s, producing nice, echoing booms. This particular firework was launching everything at once, giving us our own version of San Diego's all-or-nothing fireworks show. I liked the variety of lines and colors, and that a lot of it was captured in this shot. Shot with a Canon 7D and a 50mm f/1.4 at f/14, ISO 200, and 2 second exposure. I had no intentions to watch the fireworks along the Hudson on the 4th since I didn't feel like waiting hours without access to a bathroom. As I was scrolling through Facebook, my room suddenly lit up and I heard a loud bang coming from outside my window. I realized the block behind mine were setting off huge fireworks and rushed to grab my camera. I looked through my shots and found it interesting that the fireworks looked as if they came out of the chimney of a house behind mine. Nikon D7000, 28mm at f/7.1, 13 second exposure, ISO 100. I missed fireworks this year, but couldn't miss the opportunity to capture this picture of these "fireworks" while working on a construction project this weekend! This image is taken on a Nikon D300, 18mm, f/ 3.5 and a 2 second exposure. Fireworks reflected in the pool of my friend's backyard. The squiggly lines of the fireworks were caused by ripples in the water. It's technically an HDR because I combined two photos to balance out the exposure of the pool and yard. Taken with a Canon 7D and a Sigma 17-35 at 17mm, f/11, ISO-500, 45 second exposure for the top third, and 19 seconds for the water. Photo is a composite of several shots I took at the Stillwater Oklahoma fireworks show (at the appropriately named "boomer" lake). I put on my red white and blue, picked up some super sized fast food on the way, sat in my Oklahoma State bag chair in the weeds at the edge of the lake to capture this series of photos, then sat in traffic forever trying to get home. If that's not 'MERICA then i don't know what is! Canon 7D, Manfrotto tripod head, Sigma 10-20 Rectilinear Wide Angle, ISO 400 to ISO 100, F8 through F11, 2.5 second to 8 second exposures.Images taken in RAW, post processed in Lightroom, compositing done in GIMP. Playing with the zoom while taking photos during our local display. I zoomed in and out during the exposure, and i like the look it gave it. Canon Rebel T2i, EF-S 15-85 f/3.5-5.6 IS USM lens, exposure time 1"3, f/7.1, ISO 100. Taken at the fireworks show put on by the Austin Symphony at Auditorium Shores at Town Lake Metropolitan Park. Before the fireworks show was a free concert including many patriotic hits ending with a finale of Tchaikovsky's 1812 Overture. The fireworks show looked great over Lady Bird Lake. Shot with a Canon T1i and Canon 35mm f/1.4L. ISO 100, f/8.0, 3", bulb exposure. Very limited post processing, just a little contrast boost. Wonderful entries, everyone. It's fascinating how different fireworks can look through the use of ever so slightly different techniques. And thanks for working through all those fireworks shows for our collective enjoyment. The full galleries are below, which include a lot of great shots we couldn't feature above. The big, wallpaper-sized shots are on flickr.